Tomorrow we will celebrate the fourth anniversary of the Rossi Rifleman and I am pleased that the need I perceived has been so useful. I started this forum to gather unbiased information about my Rossi rifles but it has grown into something more. This forum has become a great group of individuals sharing their experience and knowledge of the various Rossi products with others. The level of activity here has continued to increased and as the bits & bites move back & forth it does involve an expense that must be considered. I have personally funded this forum until now but in that the cost is significant, it is time for the forum to stand on its own. I have considered advertising but I'm against it in principle on a forum that's purpose is product oriented. Several forums that I have enjoyed for years have become marketing tools and they slowly and surely become something less enjoyable. 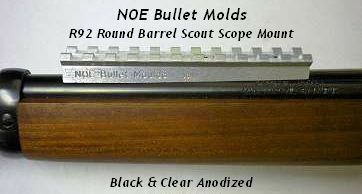 There is unpaid advertising on the bottom of every forum page that has been given to Al Nelson's NOE in appreciation of his effort in developing and the expense of tooling up the R92 scope base. The simple solution for the continued funding of the forum is through user donations. Considering the number of individuals participating, any consideration on your behalf will help the forum reach its financial goal. Donations would be appreciated and are made by using the links in the sub header or at the bottom of the page near the "Donation Goal" bar. Donations are made through PayPal but you do not need a PayPal account as through that source both credit & debit card transactions are accepted. There has been a bit of confusion when you use a credit or debit card. As a final step PayPal will ask you if you want to open an account. Ending the transaction by closing the browser at this point does not complete the donation. Just click "No Thanks" if you are not interested and the donation will be made through your card. Tapatalk users will not see the donation buttons but your support is also needed. You can click here: Rossi Rifleman Donations. The "Goal" bar will not immediately reflect the impact of your donation as It is updated only after I reconcile my PayPal account which I will do on a daily basis, usually in the morning. Besides this forum, I also own the Lee Loader Forum and both forums are somewhat joined at the hip when it comes to support. One would not survive without the other. With this in mind, the Donation Goal is a reflection of total server budget and the donation received a reflection of the sum of donations from the users of both forums. It would really help me if donations would include your username in the "Special Instructions: Note to Seller" field. Last edited by Ranch Dog on 01 Mar 2016 09, edited 2 times in total. Reason: I highlighted the instructions for using a credit card and asked that you please include your username. You're welcome. Thanks back at you for your donation! I am really glad that I found this site. For the knowledge base you make available, you have my donation and my gratitude. Michael, how are the donations doing? TinMan wrote: Michael, how are the donations doing? You can click the Donate button again and it should show you what the latest update was. I've only recently become aware of the Lee forum and haven't checked it out. Cool, had not even noticed that was there. And I will go over and check out the Lee forum as well, thanks. I think good. Sitting at 17.5% of the goal a week into it. That gives me some breathing room with the bills. I'm also aware of the burden everyone faces at home in that our economy is in an awful state and I realize that many simply cannot support an effort like this no matter their desire. So in a nutshell, yeah it's good. Funds for a 1/5 of the year in a week! I've updated the opening post with additional information about the Lee-Loader Forum as the goal is being worked on from that end as well. I'm in, thanks for making this sight happen. golfish wrote: I'm in, thanks for making this sight happen. You're welcome and thanks for your support!